I'm leaving for vacation finally :) Then directly from my vacation I go to LISA Tech Days, so see you there. While ZFS's RAID-Z2 can offer actually worse random read performance than HW RAID-5 it should offer much better write performance than HW RAID-5 especially when you are doing random writes or you are writing to lot of different files concurrently. After doing some tests I happily found it exactly works that way as expected. Now the hard question was: would RAID-Z2 be good enough in terms of performance in actual production environment? There's no simple answer as in a production we do actually see a mix of reads and writes. With HW RAID-5 when your write throughput is large enough its write cache can't help much and your write performance falls down dramatically with random writes. Also one write IO to an array is converted to several IOs - so you get less available IOs left for reads. ZFS RAID-Z and RAID-Z2 don't behave that way and give you excellent write performance whether it's random or not. It should also generate less write IOs per disk than HW RAID-5. So the true question is: will it offset enough to get better overall performance on a production? After some testing I wasn't really closer to answer that question - so I decided on a pool configuration and other details and decided to put it in a production. The business comparison is that I need at least 2 HW RAID-5 arrays to carry our production traffic. One array just can't do it and main problem are writes. Well, only one x4500 with RAID-Z2 seems to do its job in the same environment without any problems - at least so far. It'll be interesting to see how it will behave with more and more data on it (only few TB's right now) as it will also mean more reads. But from what I've seen so far I'm optimistic. If you install Solaris on servers using jumpstart then you never actually see Solaris interactive installer. But more and more people are using Solaris on their desktops and laptops and often installer is their first contact with Solaris. And I must admit it's not a good one. Fortunately Sun realizes that and some time ago project Caiman was started to address this problem. See Caiman Architecture document and Install Strategy document. Also see early propositions of gui Caiman installer. Recently 6472021 was integrated. If you want to tune ZFS here you can get a list of tunables. Some default values for tunables with short comments can be find here, here, and here. provides the St Paul  Blade platform support in Nevada. uname -i O/P for St Paul platform is SUNW,Sun-Blade-T6300. should be filed under platform-sw/stpaul/solaris-kernel in bugster. If you're changing sun4v or Fire code, you'll want to test on St Paul. will be delivered to ON PIT and ON Dev on or about Feb'8th,2007. St Paul eng team will provide the technical support. Please send email to stpaul_sw at sun dot com if any issues. Recently we migrated Linux NFS server to Solaris 10 NFS server with Sun Cluster 3.2 and ZFS. System has connected 2 SCSI JBODs and each node has 2 SCSI adapters, RAID-10 between JBODs and SCSI adapters was created using ZFS. We did use rsync to migrate data. During migration we noticed in system logs that one of SCSI adapters reported some warnings from time to time. Then more serious warnings about bad firmware or broken adapter - but data kept writing. When we run rsync again ZFS reported some checksum errors but only on disks which were connected to bad adapter. I run scrub on entire pool and ZFS reported and corrected thousands of checksum errors - all of them on a bad controller. We removed bad controller and reconnected JBOD to good one, run scrub again - this time no errors. Then we completed data migration. So far everything works ok and no checksum error are reported by ZFS. Important thing here is that ZFS detected that bad SCSI adapter was actually corrupting data and ZFS was able to correct that on-the-fly so we didn't have to start from the beginning. Also if it was classic file system we probably wouldn't have even notice that our data were corrupted until system panic or fsck needed. Also as there were so many errors probably fsck wouldn't help for file system consistency not to mention that it wouldn't correct bad data at all. bash-3.00# iostat -xnzCM 1 | egrep "device| c[0-7]$"
"The Santa Clara, Calif.-based company's server revenue rose 15.5 percent to $1.59 billion in the quarter, according to statistics from research firm IDC. The increase outpaced the overall growth of 0.6 percent to $12.29 billion worldwide, with faster gains in x86 servers, blade servers and lower-end models costing less than $25,000. Sun's three main rivals fared worse. In contrast, IBM's revenue dropped 2.2 percent to $3.42 billion; Hewlett-Packard's dropped 1.7 percent to $3.4 billion; and Dell's dropped 1.3 percent to $1.27 billion." Thanks to Alan Coopersmith I've just learned that DTrace will be part of MacOS X Leopard. When you need a bit more help in debugging, Xcode 3.0 offers an extraordinary new program, Xray. Taking its interface cues from timeline editors such as GarageBand, now you can visualize application performance like nothing you’ve seen before. Add different instruments so you can instantly see the results of code analyzers. Truly track read/write actions, UI events, and CPU load at the same time, so you can more easily determine relationships between them. Many such Xray instruments leverage the open source DTrace, now built into Mac OS X Leopard. Xray. Because it’s 2006. I used 3510 head unit with 73GB 15K disks, RAID-10 made of 12 disks in one enclosure. On the other server (the same server specs) I used 3510 JBODs with the same disk models. I used filebench to generate workloads. "varmail" workload was used for 60s, two runs for each config. 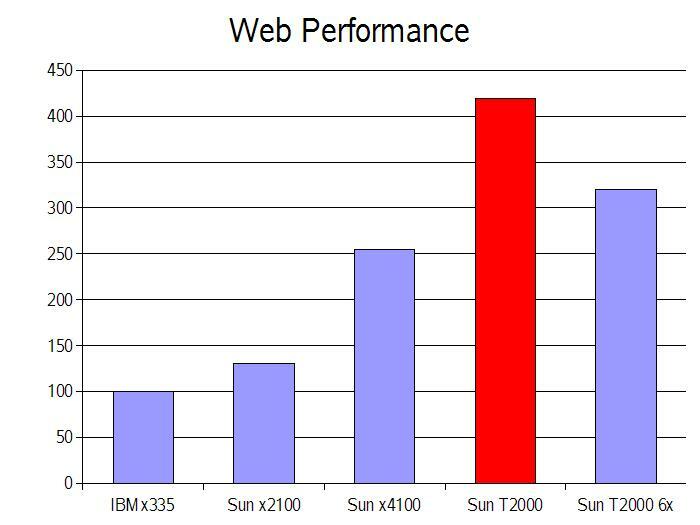 In other tests HW vs. ZFS software raid show about the same performance. So it looks like at least in some workloads software ZFS raid can be faster than HW raid. Also please notice that HW raid was done on real HW array and not some crappy PCI raid card. For more details see my post on ZFS discuss list. Finally both books of new Solaris Internals are available. It's must buy for everyone seriously using Solaris. Or rather not? See this blog entry and learn what is so different about Thumper. I can't wait I get one for testing. It could be just great architecture for NFS servers. Looks like we can expect new workstation from Sun soon. Look at BugID 6444550: "Next month, Munich workstation will be shipped." My ZFS presentation and my Open Solaris presentation from last Unix Days. These presentations are in English. You can download there also other presentations from Unix Days however some of them are in Polish. Open Solaris gets Xen dom0 support. I haven't played with it yet but it looks like 32/64 bit is supported, MP (up-to 32-way) is supported, domU for Open Solaris/Linux, live migration - well lots of work in a short time. More details at Open Solaris Xen page. Some behind scene blog entry. Well, 2x dual Opteron + 48x SATA disks in 4U with list price about 2,5$ per GB. On Tuesday's Network Computing Sun is going to show new Opteron servers. Some speculations on these servers from The Register. Nexenta got Zones support - well done. I'm really impressed with progress those guys (and women?) are doing. Fault management support for ZFS, which also is new in Solaris 10 6/06. Well many people are curious if SystemTap is ready for production. On last UNIX DAYS we had an presentation about SystemTap prepared by our friend. Well during his preparations for the conference he almost got used to many system crashes a day. That alone speaks for itself. Then SystemTap currently lacks user space tracing and many many more things. I wouldn't put it in a production anytime soon and I don't know anyone who is using it. James posted a well balanced blog entry about it. Finally Solaris 10 06/06 (update 2) is available. Read What's New. NexentaOS Alpha 5 is available - just in time to celebrate Open Solaris One Year Anniversary. You can download it here. I must say that it's truly amazing what people behind Nexenta are doing. Just after one year Open Solaris hit the streets they provide almost fully working GNU distribution based on Open Solaris and Debian. I'm really impressed. "This release of NexentaOS brings to you fully integrated Ubuntu/Dapper Drake userland. Today NexentaOS APT repository contains more than 11,000 Ubuntu/Dapper packages. This number is constantly growing, driven mostly by our industry-strength AutoBuilder." Sun's Java SE 5.0 Java Development Kit (JDK(tm)) distributed under the new Distributor's License for Java. Available via NexentaOS APT repository. Live Upgrade. Starting from Alpha 5 we are supporting out-of-APT upgrade of the OpenSolaris core. Use Debian tools to bring your system up to the bleeding edge.. Minimal and full installation, safe mode boot option, removable drive support. OpenOffice.org 2.0, natively compiled on NexentaOS. OpenSolaris build #40, non-DEBUG kernel. GNOME 2.14.x with a bunch of neat features, in particular Application Add/Remove. KDE 3.5.2 and XFCE 4.3 alternative desktop environments. Samba 3.0 (server and client included with InstallCD), iSCSI, ZFS with the latest fixes and updates. And 11,000 more packages, including the most popular office applications, graphics, and multi-media. I'm definitely not a developer but still I can do some C programming. In order to better understand ZFS I was playing/looking with its sources like adding my own "compression" to ZFS during Christmas (I know... but it was really late night and I didn't want to sleep) or later I wanted to implement RFE: 6276934 ability import destroyed pools as I think that in some cases this would be very useful. Additionally while playing with ZFS sources I already knew that implementing this should be really simple and I wanted to test how in practice it's easy (or not) to get your code integrated into Open Solaris (and later into Solaris). I signed Contributor Agreement, made necessary code changes, tested it then made manual changes. Now I requested a Sponsor - Darren Moffat offered his help. ARC case was needed as new options were added, code review was also needed and some paper work. Thankfully for me Darren took care of all of this - thank you. A while later my code changes were integrated (snv_37) into Open Solaris and will also be available in upcoming Solaris 10 Update 2. You can read more about my changes here. The point is that it's easy to get your code integrated to Open Solaris and you don't have to be a developer - if you are for example a system admin and you find something annoying (or lack of something) in Open Solaris you can easily fix it and share your fix with others. And that's one of the main goals of Open Solaris, isn't it? There are people afraid that contributing code to Open Solaris could actually mean worse code - fortunately it's NOT the case as even if you are not from Sun you have to submit your changes to code review, ARC, follow coding style in Open Solaris, etc. and fortunately for you (submitters) Sun people will take care of this - you just write changes. That way a high quality of code in Open Solaris is preserved. Here you can find other bug fixes by non-Sun people into Open Solaris. There are quite a lot of them just after one year Open Solaris is here. Yesterday, June 14th, was a first year Open Solaris anniversary! What a year - lot of things happened and most of them good. Just quick glance at stats shows that Open Solaris already is a success with more people interest that everyone thought. I think that Open Solaris just after one year is far ahead of that we all expected it to be which is very good. To celebrate PLOSUG formation and Open Solaris anniversary we had a first PLOSUG meeting yesterday. Just after last Unix Days - Andrzej and I decided to create Polish Open Solaris User Group - PLOSUG. We were supposed to do it few weeks ago but... Anyway here we are. Tomorrow (June 14th) is the one year anniversary of Open Solaris so we think it's a good opportunity to get together and celebrate both: the anniversary and a creation of PLOSUG. You can find more info about tomorrow meeting on PLOSUG page. If you are from Poland and want to participate, talk, etc. about Open Solaris and its technologies, and also meet from time to time then please join to us. ps. this entry is in English however we'll mostly talk in Polish on PLOSUG mailing-list I guess. In some places I use SATA drives for data storage. From time to time there is a problem with filesystems and I have to fsck, sometimes files are a little bit garbled, etc. Last time I tried ZFS on SATA disks and to my surprise - just after 3 days I got few hundreds checksum error - well, that explains a lot. Then it stabilized and now from time to time I see occasional errors. Sometimes we had to live with some problems for so long without any alternative that we have forgotten about a problem and got accustomed to fsck, some bad files, etc. I would say that ZFS changes that picture radically. Thanks to ZFS there's no need to fsck, proper data are returned to applications, no mangled fs entries, etc. I can't understand Sun's policy about warranty for Coolthread servers - only 90 days??!??! Their other entry level servers have at least 1yr - and all their opteron server have 4yrs by default (even x2100). So why T1000 has only 90 days of warranty? (T2000 was changed lately to 1yr). To make things worse you can't buy T1000 with a Bronze support - you have to buy Silver at least - but that means quite a cost in a 2nd and 3rd year if you want 3 years "warranty" - I know you get more but sometimes you don't need more and all you need is a simple (cheap) warranty. IMHO it should be corrected as soon as possible so Niagara servers are treated at least the same way as Opteron servers - 3yrs warranty by default. Bronze support should also be offered (at least it's not possible to buy bronze support for T1000/T2000 here in Poland). Sun's warranty matrix for entry level servers. Finally Hot Spare support is integrated. We all know ZFS is great. RAID-Z means fast RAID-5 without HW RAID controller. However the devil is in the details - while raid-z is great for writing speed, data integrity, etc. its read performance could be really bad if you issue many small random reads from many streams and your dataset is big enough that your cache hit ratio is really small. Sometimes the solution could be to make a pool with many raid-z groups - it means less available storage, but better performance (in terms of IO/s). So if you want to use raid-z in your environment first carefully consider your workload and if many raid-z in one pool aren't good solution for you then use different raids offered by ZFS. Fortunately other raids in ZFS are NOT affected that way. If you need more details then read Roch's blog entry on it. Interesting article on fork()/system()/popen()/posix_spawn() and memory overcommit. Another T1000 arrived few days ago for testing - just after UNIX DAYS I'm going to start testing it. Adam Leventhal has added new features to USDT probes in DTrace - especially is-enabled probes are a great add-on. Richard's Ranch has posted some info on Memory Page Retirement in Solaris which is part of Predictive Self Healing. If you want more details you should read: Assessment of the Effect of Memory Page Retirement on System RAS Against Hardware Faults. What a coincidence because just one day earlier one of our servers encountered uncorrectable memory error. Fortunately it happened in user space so Solaris 10 just cleared that page, killed affected application and thanks to SMF application was automatically restarted. It all happened not only automatically but also quick enough that our monitoring detected problem AFTER Solaris already took care of it and everything was working properly. Here we have a report in /var/adm/messages about problem with memory. May  8 22:47:03 syrius.poczta.srv     UDBL Syndrome 0xfc Memory Module Board 6 J???? UNIX DAYS - Gdansk 2006. This is a second edition of a conference about What's New in UNIX (on a production). The conference will be at Gdansk, Poland on May 18-19th. This time we managed to get Wirtualna Polska, Sun, Symantec, EMC, Implix and local university involved - thank you. What is it about and how it started? In October 2005 I thought about creating conference in Poland about new technologies in UNIX made by sysadmins for sysadmins (or by geeks for geeks). The idea was to present new technologies without any marketing crap - just technical. So I asked two of my friends to join me and help me make it real. Then I asked my company, Sun, Veritas and local university to sponsor us - and they did. That way UNIX DAYS 2004 was born. The conference took two days and all speakers were people who were actually using technologies they were talking about in a production environments. I must say that conference was very well received. Unfortunately due to lack of time there was no UNIX DAYS in 2005. See you at UNIX DAYS! update: well, we had to close public registration just after one day - over two hundred people registered in one day and we do not have free places yet. It really surprised us. ps. our www pages are only in Polish - sorry about that. Hosting webapps on Solaris instead of FreeBSD? Why not :) Looks like that is exactly what Joyent is going to do. Look at this pdf - how they consolidate on Niagara boxes, use zones, zfs, etc. Software RAID-5 solutions were always much slower in writing data than RAID-10. However ZFS completely changes that picture. Lets say we've got 4 disks - with all the other software RAID solutions when you create RAID-5 from these 5 disks then writing to them will be MUCH slower than if you created RAID-10. But if you create RAID-5 (in ZFS called RAID-Z) from these 5 disks the you will see that writing performance is actually much better then RAID-10. I did such a test today with 4 disks and sequential writing to different RAID levels using ZFS and 'dd' command. In theory ZFS in this test (writing) should give us the performance of two disks in case of RAID-10, the performance of 3 disks in case of RAID-Z and the performance of 4 disks in case of RAID-0. And that's exactly what we see above! (117/2 = 58.5000 ; 175/3 = 58.3333 ; 233/4 =58.2500). MySQL on Solaris faster than on Linux? Yahoo reports that MySQL on Solaris is faster than on Linux. SANTA CLARA, Calif., April 21 /PRNewswire-FirstCall/ -- Sun Microsystems, Inc. (Nasdaq: SUNW - News) today announced new benchmark results involving the performance of the open source MySQL database running online transaction processing (OLTP) workload on 8-way Sun Fire(TM) V40z servers. The testing, which measured the performance of both read/write and read-only operations, showed that MySQL 5.0.18 running on the Solaris(TM) 10 Operating System (OS) executed the same functions up to 64 percent faster in read/write mode and up to 91 percent faster in read-only mode than when it ran on the Red Hat Enterprise Linux 4 Advanced Server Edition OS. "MySQL and Sun have worked to optimize the performance of MySQL Network software certified for the Solaris 10 OS," said Zack Urlocker, vice president of marketing for MySQL AB. 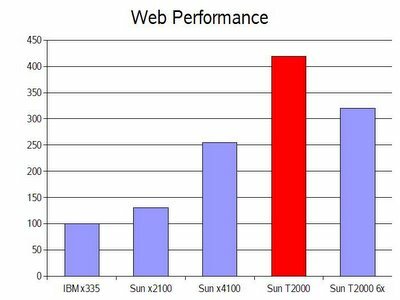 "This benchmark demonstrates Sun's continued leadership in delivering a world-class operating environment that provides excellent MySQL performance for our mutual enterprise customers." I wonder if it means there were some changes to MySQL so it runs faster on Solaris? In our internal tests MySQL on Linux (however older MySQL versions) was actually slightly faster than on Solaris - maybe we should re-check it. Unfortunately not much info on actual system tuning and disk config is reported (was ZFS used? how much IOs were generated, etc.). Actual benchmark is here and official Sun announcement here. As T1000 uses only two memory controllers out of 4 in US-T1 it could be slower than T2000 with the same CPU - I guess it could depend on application - we'll see how it's here. Yesterday system which is E6500 with Solaris 10 reported few times memory errors (ECC corrected) on a board 0 dimm J3300. As these errors happened few more times system finally removed single page (8kB) from a system memory so problem will not escalate and won't possibly kill system or application. Well, I can live with 8kB less memory - that's real Predictive Self Healing. Booting from ZFS was integrated in b37 which is available as SXCR right now. It's not a final solution - it's ugly but it's a beginning. The real fun will begin when GRUB will understand ZFS. You can see instructions on how to boot from ZFS in b37 at Tabriz's weblog. Another benchmark showing T2000 scalability in various microbenchmarks and comparing it to 12-way (24 cores) E2900. Most of the benchmarks are HPC focused. "If you are interested in downloading the SolarisTM Containers for Linux Applications functionality, BrandZ DVD 35 for the SolarisTM Operating System (Solaris OS) for x86 platforms is available now as a free download from the Sun Download Center. Based on SolarisTM Express build 35, this download is a full install of Solaris OS and includes all of the modifications added by the BrandZ project. BrandZ is a framework that extends the SolarisTM Zones infrastructure to create Branded Zones, which are zones that contain non-native operating environments. Each operating environment is provided by a brand that may be as simple as an environment with the standard Solaris utilities replaced by their GNU equivalents, or as complex as a complete Linux user space. The brand plugs into the BrandZ framework. The combination of BrandZ and the lx brand, which enables Linux binary applications to run unmodified on Solaris OS, is Solaris Containers for Linux Applications. The lx brand is not a Linux distribution and does not contain any Linux software. The lx brand enables user-level Linux software to run on a machine with a Solaris kernel, and includes the tools necessary to install a CentOS or Red Hat Enterprise Linux distribution inside a zone on a Solaris system. The lx brand will run on x86/x64 systems booted with either a 32-bit or 64-bit kernel. Regardless of the underlying kernel, only 32-bit Linux applications are able to run. As part of the OpenSolaris community, BrandZ is a hosted project on this open source web site that contains detailed information on BrandZ and the latest information on build 35." Finally new book from authors of the old Solaris Internals book - actually two books. One (over 1000 pages) about Kernel Architecture in Open Solaris and Solaris 10 and the other one about Solaris Performance and Tools (yep, DTrace). This time there are three authors: Richard McDougall, Jim Mauro, Brendan Gregg. Judging from the last book they wrote these two already are a must have books. New way of CPU management - CPU caps. It allows you to set limits on applications (projects and zones) in a percentage of single CPU (although application can still use all CPUs). Right now this is available as a preview on Open Solaris Resource Management Project. Finally Oracle 10g R2 64bit version for Solaris on x64 is released. It's good to see another Niagara tests done by people outside Sun - customers. We found Niagara servers to be really good in many workloads, not just www (both comparing to traditional SPARC servers or x86/x64 servers). Here you can find benchmark of T2000. So, after a week with the Niagara T2000, I’ve managed to find some time to do some more detailed benchmarks, and the results are very impressive. The T2000 is definitely an impressive piece of equipment, it seems very, very capable, and we may very well end up going with the platform for our mirror server. Bottom line, the T2000 was able to handle over 3 times the number of transactions per-second and about 60% more concurrent downloads than the current ftp.heanet.ie machine can (a dual Itanium with 32Gb of memory) running identical software. Its advantages were even bigger than that again, when compared to a well-specced x86 machine. Not bad! 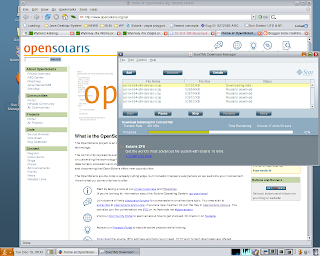 Finally my patch has been integrated into Open Solaris build 37. I must say that a procedure to integrate a patch into Open Solaris is really easy - just send a request for a sponsor (someone to help you) to request-sponsor list then someone will offer his/her self to be your sponsor and that's it. Of course it would be a good manner to first discuss the problem on related Open Solaris list if it involves new functionality, etc. If it's just simple bug you can skip this part. What is the patch I wrote about? It adds functionality to ZFS so you can list and import previously destroyed pools. It was really simple but I guess it would be useful. The actual RFE is: 6276934. This should be available in Nevada build 37 and it looks like it will make it into Solaris 10 update 2. Some time age I wrote that FMA enhancements for AMD CPUs are integrated into Open Solaris. Thanks to Gavin Maltby here are some details. Really worth reading. The Rock processor - due out in 2008 - will have four cores or 16 cores, depending on how you slice the product. By that, we mean that Sun has divided the Rock CPU into four, separate cores each with four processing engines. Each core also has four FGUs (floating point/graphics units). Each processing engine will be able to crank two threads giving you - 4 x 4 x 2 - 32 threads per chip. Sun appears to have a couple flavors of Rock – Pebble and Boulder. Our information on Pebble is pretty thin, although it appears to be the flavor of Rock meant to sit in one-socket servers. Boulder then powers two-socket, four-socket and eight-socket servers. The servers have been code-named "Supernova" and appear impressive indeed. A two-socket box – with 32 cores – will support up to 128 FB-DIMMs. The eight-socket boxes will support a whopping 512 FB-DIMMs. Sun appears to have some fancy shared memory tricks up its sleeve with this kit. Well, that was fast. Looks like you can actually boot Linux/Ubuntu on Niagara! they come with patches for performance or features :-)). In my previous blog entry I wrote that one T2000 (8 core, 1GHz) is approximately about 5-7 times the performance of a single E6500 (12x US-II 400MHz) in our production. Well to get even a better picture how it scales with our applications we created two Zones on the same T2000 but this time we put applications from one E6500 into one zone and applications from another E6500 (the same config) into second zone. Then we put these two zones into real production instead of these two E6500s. These E6500s during peak hours are overloaded (most of the time 0% of IDLE cpu and dozen threads queued for running, some network packet drops, etc. - you get the idea). Well T2000 with exactly the same production workload is loaded at about 20% peak, no network packet drops, no threads queued. So there's still lot of head-room. In order to see how T2000 is capable of doing IOs I increased some parameters in our applications so data processing was more aggressive - more nfs traffic and more CPU processing - all in a production with real data and workload. Well, T2000 was reading almost 500Mb/s from nfs servers, writing another 200Mb/s to nfs servers, and communicating with frontend servers with about 260Mb/s. And still no network packet drops, no threads queued up, server was loaded at about 30% peak (CPU). So there's still large head-room. And all of this traffic using internal on-board interfaces. When you add numbers you will get almost 1Gb/s real production traffic. Unfortunately our T2000 has only 16GB of memory which was a little bit problematic and I couldn't push it even more. I whish I had T2000 with 32GB of ram and 1.2GHz UltraSparcT1 - I could try to consolidate even more gear and try more data processing. Applications weren'r recompiled for UltraSparcT1 - we use the same binaries as for E6500 and applications were configured exactly the same. NFS traffic is to really lot of small files with hundreds of threads doing so concurrently, with a lot of meta data manipulation (renaming, removing files, creating new ones, etc.) - so it's no simple sequential reading of big files. On-board GbE NICs were used on T2000. No special tuning was done especially for T2000 - the same tunables as for E6500s (larger TCP buffers, backlog queues, more number of nfs client threads per fs, etc.). Solaris 10 was used. We put T2000 (8x core, 1GHz) instead of E6500 with 12x US-II 400MHz into our production. We've got heavily multithreaded applications here. Server is doing quite a lot of small NFS transactions and some basic data processing. We didn't recompile applications for T1 - we used the same binaries as for US-II. Applications do use FPU rarely. T2000 gives as about 5-7x the performance of E6500 in that environment. ps. probably we can squeeze even more from T2000. Right now 'coz lack of time we stay with 5-7x. We did real production benchmarks using different servers. Servers were put into production behind load-balancers, then weights on load-balancers were changed so we got highest number of dynamic PHP requests per second. It must sustain that number of requests for some time and no drops or request queue were allowed. With static requests numbers for Opteron and T2000 were even better but we are mostly interested in dynamic pages. T2000 is over 4x faster than IBM dual Xeon 2.8GHz! Except x335 server which was running Linux all the other servers were running Solaris 10. Our web server is developed on Linux platform so it's best tuned on it. After fixing some minor problems web server was recompiled on Solaris 10 update1 (both SPARC and x86). No special tuning was done to application and basic tuning on Solaris 10 (increased backlog, application in FX class). Web server was running in Solaris Zones. On x4100 and T2000 servers two instances of web server were run due to application scalability problems. On smaller servers it wasn't needed as CPU was fully utilized anyway. Minimal I/O's were issued to disks (only logs). Putting application into FX class helped a little bit. Perhaps putting application in a global zone, doing some tuning to Solaris and application itself plus tweaking compiler options could get as even better results. For more details on T2000 visit CoolThreads servers web page. You can also see SPECweb2005 results which do include T2000. 5. Sun T200o 6x, 1x UltraSparc T1 1GHz (8 cores, - two cores (8 logical) were switched off using psradm(1M). The Linux kernel has booted on top of the sun4v hypervisor on Sun's new Niagara processor (it's just the kernel, there was no root filesystem). BigAdmin has created new page with resources for laptop users. Please notice that Solaris Express 2/06 is more tested than Solaris Express Community Edition. SX 2/06 is based on build 33 of Open Solaris (SX CE is based on b33 right now). There are lot of changes this time - see Dan Price's What's New. First one is most interesting - I hope someone from Sun will write a blog entry about it with more details. Quickly looking at some files I can see that memory scrubbing for x86 was added (or maybe it was before on x86?). It also looks like page retirement on x86 is implemented. These should be in Solaris Express build 34.